It’s the Gorilla vs. The Polar Bear! The announcers are wondering if Moreira will be as successful as his Brazilian countrymen Royce Gracie and Marco Ruas, who combined to win four of the first seven UFC tournaments. Hey, no pressure. The 300-pound Varelans was the runner-up in UFC 7. Moreira controls the tempo by backing up and making Varelans come to him. Both men sneak in a good punch or two. They stay on the feet all the way and the judges decide Moreira spent too much time running away. Varelans wins a unanimous decision, as all three judges hold up his name on pieces of paper. Ferrozzo bulls Bohlander up against the cage and takes him down twice. Ferrozzo tries for a choke but can’t get it, and Bohlander escapes and tries a choke of his own. Ferrozzo takes control on the mat, but McCarthy calls the doctor to check a cut on Ferrozzo. They start again with Ferrozzo squashing the smaller man against the cage. Bohlander blocks a takedown and sinks in a guillotine choke for the tapout! Great comeback, and the Davids are up 2-1 on the Goliaths. Herrera is an All-American wrestler from the University of Nebraska who trains with Tank Abbott in Huntington Beach, Calif. He’s the lightest in the field at 185 pounds. The announcers discuss Goodridge’s claim of beating 1,000 Japanese men in arm wrestling in just two hours. Is that possible? Herrera gets a takedown, but Goodridge lands a series of vicious elbows that knocks him all the way out. This fight only took 13 seconds, as the Goliaths tie the score. Unfortunately, we learn that Varelans can’t continue as the announcers speculate that he broke his hand. Sam Atkins will take his place, thanks to his submission win over Keith Mielke in an alternate match before the pay-per-view went on the air. Beck says Frye has “a mean streak that runs 10 generations deep.” Atkins just learned that he was fighting, so we have to wait for him to get taped. He is a former sparring partner of Riddick Bowe. Frye hits a single-leg takedown and starts blasting Adkins with hard right hands. Adkins is busted wide open, and McCarthy jumps in to stop the carnage. Frye looks unbeatable tonight. The destruction lasted 48 seconds. Bohlander is trying to outwrestle Goodridge, but the big Canadian won’t go down. Goodridge takes control on the ground, but Bohlander prevents him from landing any major shots. Bohlander reverses into a mount and tries some ground-and-pound and headbutts. Goodridge overpowers his opponent and he’s on top now. After a while, he breaks through and batters Bohlander for the technical knockout at 4:58. Shamrock is the most experienced fighter here. Kimo, a 270-pound Hawaiian, put himself on the map by roughing up Royce Gracie in a losing effort at UFC 3. Shamrock starts with a right hand and a single-leg takedown. Severn is helping on commentary. Kimo gets on top and lands a nice right, but Shamrock reverses and makes Kimo tap out to an ankle lock. Frye’s two wins came in less than one minute, while Goodrich has fought for six minutes. Frye holds his own until Goodrich grabs Frye for a couple of quick takedowns. Frye clobbers Goodrich with devastating uppercuts, but he keeps coming back! Goodrich takes him down, but Frye lands some more powerful punches, and Goodridge’s corner throws in the towel. 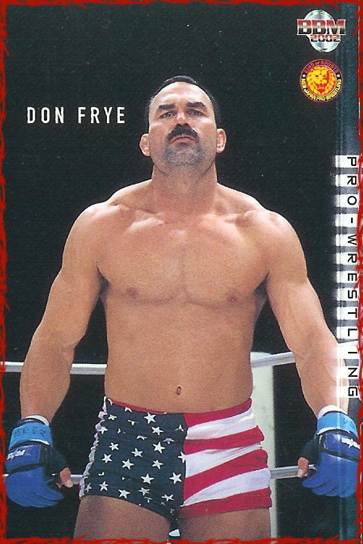 Don Frye wins UFC 8 in dominant fashion. Good night!